There seemed to have been two elections in Palestine on Sunday: the one conducted in the West Bank and Gaza, and the one in Jerusalem. Voting day in the West Bank and Gaza was marked in many places by a mood of ebullience and celebration. There was singing, dancing, the firing of guns into the air, families strolling together to the polling stations. Palestinian women’s organizations had spent weeks encouraging women to vote, and many women did show up for their first election, especially in urban centers. While not all checkpoints were eased and not all Palestinians wanted to vote under an occupation regime, the overall climate was one of hope and a new beginning. Voting day in Jerusalem, on the other hand, was marked by a flawed process. The Israeli government could not prevent Jerusalem’s Palestinian residents from participating in the elections, but it wanted to avoid the appearance of Jerusalem being part of the Palestinian Authority. Therefore, the authorities designed a voting system that was a pearl of Talmudical caginess, allowing for the vote, but giving it the appearance of an absentee ballot being cast in Jerusalem for sending to a Palestinian state that was “somewhere else”. Therefore, voting was carried out only in post offices, where marked ballots were handed to postal clerks who inserted them into special mailboxes, presumably to be “mailed” to Palestine. Special attention was given to the location of the slot. The Israeli authorities felt strongly that a slot on the top of the box would give the appearance of a real ballot box. Therefore, these mailboxes had slots on the side. Here’s a photo (left) I took of a man at one of these red mail-ballot-boxes, behind a glass pane and inaccessible to the voter. Note also the lack of privacy, with the clerk looking on as the man voting leans on the counter marking his ballot, and the next voter edging closer. Worst of all, only 6,000 Jerusalemites out of 125,000 were allowed to vote in town, with the rest dispatched to voting stations out of town, to which access through checkpoints was eased, but still not easy. Under these conditions, many Palestinians in Jerusalem refused to vote. And many were afraid to vote, in fear that Israel would regard that as grounds for canceling their Jerusalem residency rights. It’s no wonder that a Palestinian woman carrying a bunch of bananas stood outside the main post office on the Palestinian side of Jerusalem, handing out flyers that called Israel a “banana republic democracy”. I too wanted to see the excitement on the other side of town, so I answered the call of Bat Shalom, a women’s peace organization, to help keep the extremist Israeli right from carrying out their threat to disrupt the proceedings. As six of us walked together toward the Palestinian side of Jerusalem, an Israeli police officer stopped us, said he knew of our plan, and that our presence would “provoke counter-demonstrations”. We argued for a while, and then he announced we were under arrest, to prevent us from ‘disturbing the peace’. We were shocked, but a moment later he was distracted by a phone call, so we simply slipped away and melted into the side streets, splitting up so we would be less obvious if he sent a posse. One would think the police had better villains to worry about. Despite the many difficulties and Israel’s grudging cooperation, the vote did take place, leaving many Palestinians and even Israelis with a sense of elation. A real election was held – with real competition and no mud slinging – and the candidate who consistently called for an end to the violence and negotiation of a real peace was swept into power with 62% of the vote. Now the proverbial ball is in Israel’s court, and the excuse for not negotiating is long dead and buried. 24 hours later and on the Jewish side of town, the new Israeli government – comprising Likud, Labor, and United Torah Judaism, an ultra-Orthodox party – was sworn in, thanks to Sharon’s wily brinkmanship with the extremists from his own party who oppose the disengagement from Gaza. The government will now have the parliamentary strength it needs to get out of Gaza, and Shimon Peres is back in power, defying age, wisdom, and public incredulity. And the anti-evacuation settlers are digging their own graves. Once considered the last of the idealists, support for the settler movement has plummeted among Israelis in the wake of recurring violent clashes with Israeli soldiers evacuating settler outposts. Today, the settlers are regarded as the anti-democratic, lunatic fringe. In truth, the vast majority of settlers are far more moderate, and would leave the territories in a heartbeat for the price of their property, but the fanatics are now setting the tone and image. By the way, in a small meeting this evening where former US President Jimmy Carter, chief election observer in the Middle East, spoke to the participants of the Ecumenical Accompaniment Program (which I was lucky to have attended), this honorable man berated people for using the term “fence”. Said Jimmy, “Israel has successfully convinced the United States that this is an innocuous fence, as if it were a fence around a cow pasture, but this is really a dividing wall and we should refer to it as such…This wall is one of the most vivid vulnerabilities of Prime Minister Sharon’s policies.” Bravo, Mr. Carter, for more plain talk. Monday was also a red letter day for supporters of human rights, as Israel’s High Court ruled that lesbian couples may now officially adopt each other’s children. We are all grateful to Tal and Avital Yaros-Hakak, who sacrificed their privacy to establish this important precedent. Finally, the tragedy in the Indian Ocean, and it takes a religious extremist to have figured it out: A Muslim cleric announced that the Zionists caused the Tsunami. This was practically confirmed by a rabbi in Israel, who announced that God doesn’t like non-Jews, and that’s why he dropped all this water on them. Jewish-Muslim consensus, at last, helping us understand the mystery of God’s ways. You had to choose your demonstration carefully during this week of Passover. 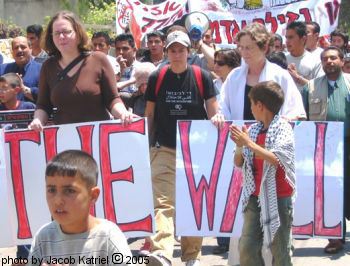 If you went to the one in Gaza or the northern West Bank, joining right-wing settlers to protest their imminent evacuation, your activities would be secured by Israeli soldiers and border police to protect you from the neighboring Palestinians – unarmed and simply waiting for the settlers to depart. 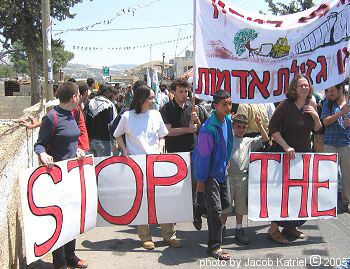 If you went to the ultra-Orthodox demonstration against further construction of the new Highway 6 – allegedly set down on an ancient burial site – you could “throw rocks, bricks, metal rods and benches at the police” [Ha’aretz, 28 April 2005] with relative impunity. Yes, some of the ultra-Orthodox were beaten with billy clubs and another 15 were arrested after storming the home of the highway’s chief engineer, but otherwise it was all in the family. On the other hand, if you attended yesterday’s demonstration against construction of the Separation Wall at Bil’in, a Palestinian village in the Occupied Territories, you were in for a surprise. Not only were the demonstrators ferociously attacked by Israeli soldiers with stun grenades, tear gas, billy clubs, and bullets, but there were actual provocateurs spread among the demonstrators who deliberately set off the melee by goading the soldiers and hurling rocks at them. Sound like a scene from an old-fashioned despotic regime? Indeed, and partially acknowledged by the Israeli army: “We did have agents among the demonstrators, but only to do surveillance of them, and they did not begin the throwing of stones, but joined in to prevent their identities from being revealed” [TV Channel 10 news, 29 April 2005]. The demonstrators, mostly Palestinian villagers and some Israeli peace activists, were all committed to nonviolence and experienced in not giving the army a pretext for opening fire. They were there to plant olive trees. They did not throw stones. The army’s claim that their undercover agents threw stones to avoid revealing their identity is absurd. First of all, the police code of conduct prohibits such unethical behavior. Secondly, demonstrators can choose their level of involvement, and no one is regarded with suspicion for hanging back from the front line of demonstrators. Clearly, this was a deliberate act of provocation by the army. And why provoke? This is part of the ongoing Israeli policy of zero tolerance for protest by Palestinians, in an effort to stifle dissent and resistance to the Israeli occupation. And don’t bother us with arguments about the right to protest; the “only democracy in the Middle East” stops at the checkpoints into the occupied territories. And so, as we reach the end of Passover week, with its celebration of the liberation of the Israelites from Egypt thousands of years ago, it’s easy to sink into the myth and ignore reality. Occupation corrupts and brutalizes the occupier, shackling the oppressors to their need to control the oppressed. Let my people go. Despite the political turmoil in Israel, I have not written for a while because I have been otherwise engaged – more about that in a moment. First, the good news about the Gaza disengagement: Above all, the million plus Palestinians in Gaza who have had the Israeli boot in their neck for 37 years will finally see that boot lifted, beginning in 10 days. That, above all, is the achievement of leaving Gaza – giving Gazans back their lives. My friend ‘Inam may find her highly educated children (doctor, engineer, computers, etc.) begin to drift back home from their overseas jobs, bringing grandchildren and strengthening the fabric of Gazan society. Insh’Allah. More good news is that Israeli politicians are acknowledging the need for Gaza to have access to the world by land, sea and air, and are negotiating the opening of these ports. This is not yet public information, but a fact. International pressure does work. Also the misdeeds of the settlers in resisting the disengagement – their violence, their spurning of law and democracy in favor of “what God tells them” – have begun to reveal the religious madness and materialistic greed driving their ideology. Exposed at last are the plush villas, the exorbitant demands for ‘replacement villas’ on choice beachfront land inside Israel, and – above all – their rejection of the democratic process as inconsistent with God’s will. This was epitomized this week by the egregious murder of Israeli Druze citizens by an AWOL soldier seeking to halt the disengagement. Post-disengagement, the settlers will no longer fool anybody by their claim to having the best interests of the state at heart, and that is a good result, though achieved with great pain. The bad news continues to be Sharon’s tightening grip on the West Bank through more settlement expansion, more uprooting and destruction of Palestinian homes and land, and the ongoing construction of the Separation Wall, snaking its way through Palestinian towns and lives. International objection to all this is growing more widespread, due to the cumulative effect of all our efforts, and these must continue. One such effort is the reason I have been too busy to write in recent months – helping organize the International Activist Conference of Women in Black, to begin Friday (August 12) in Jerusalem. This event will bring 700 women from all over the world to see a slice of the oppression with their own eyes, helping strengthen their work as “Women Resist Occupation and War”, the title of this four-day event. As the news came in last night about Ariel Sharon’s “mild stroke” – and I wish him a speedy recovery and good health – I got to thinking about the white-water pace of Israeli politics. Always something new and intense. Then it dawned on me that this is what life in Israel is all about – one intense moment after another. If it’s not a brutal suicide bombing, it’s the theatrical Gaza disengagement or the meteoric resurrection of the Labor Party or the meltdown of the Likud Party or an entirely new reshuffling of the political cards now that Sharon is newly old and mortal. Is this a need for a regular “intensity fix”? More about this another time, perhaps. The most recent chapter concerns Ariel Sharon, whose hegemony is now threatened as health and age become issues in the campaign. Amir Peretz has a realistic chance, as social-economic issues take center stage for the first time in Israeli elections. But can Peretz convince voters that he is capable of making peace with the Palestinians, and that a negotiated settlement is preferable to a unilateral and limited ‘disengagement’? Or will Sharon force the return of security issues by renewed incursions, assassinations, and air strikes?